A former Canberra bikie boss has beaten drugs, weapons, and armour charges after prosecutors could not prove the drugs were his or the weapons were dangerous. Mohammed Nchouki​, 37, pleaded not guilty in the ACT Magistrates Court to eight charges of unauthorised possession of a banned firearm, possessing a prohibited weapon without a permit, possessing ammunition, and possessing a prohibited substance and a drug of dependence. He was acquitted of all counts after a hearing before Magistrate Bernadette Boss last month. 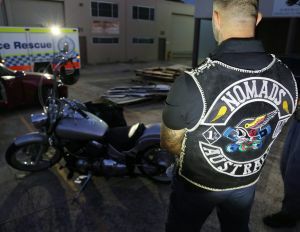 Police raided the southside home and car of the former joint-president of the ACT chapter of the Nomads Outlaw Motorcycle Gang in June last year. A police statement of facts, tendered in court, said officers found a handgun, ballistic vest, and cannabis in a Toyota Hilux parked in the driveway. Two further vests and a iphone stun gun-like device were found in a wardrobe, while cocaine was found in an office. At the hearing, the court heard the ute and office had been used for work purposes and could have been accessed and used by other employees of a building company. Dr Boss also rejected evidence certificates relied on by the prosecution, designed to prove that Nchouki was not authorised to possess the weapons, because the documents had not been signed by a person with the correct authorisation. A witness from the firearms registry said searches of the online database showed Nchouki did not hold a firearms licence. However, under cross-examination by defence barrister Jack Pappas, she said she had not checked if Nchouki had other permits or authorisations to possess the weapons. On day two of the trial, a ballistics expert conceded he did not have the expertise to identify the body armour, had not properly tested the taser-like device to prove it could administer an electric shock, and not opened the ammunition to check if it contained propellant to allow it to be fired. In closing, Mr Pappas argued Nchouki should be acquitted of possession of cocaine and cannabis charges because the court could not rule out the drugs belonged to someone else. Mr Pappas also argued the prosecution could not exclude Nchouki had authorisations to hold the weapons. The barrister said the prosecution had also failed to prove that the vests were in fact soft body armour, that the ammunition contained the required propellant, and that the iPhone had been capable of delivering an electric shock. In acquitting Nchouki, Dr Boss ordered the police pay Nchouki's costs.